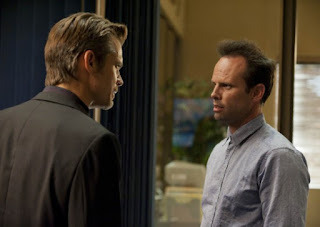 Episode Review: JUSTIFIED, "The Gunfighter"
SPOILER ALERT: It's hard to start off this recap without alluding to what happened at the end of Season 2, so if you aren't caught up and don't want to be spoiled, you might want to come back later. Over the last couple of seasons, one show that critics kept raving about was FX's Justified. At first, I didn't pay too much attention to the hype, but the show's second season really picked up its game, so I was intrigued. I was won over after catching up on the first two seasons, which is why I'm here today. The Season 3 premiere was a strong outing for the show that set up some potentially interesting arcs, but part of me wonders if it can live up to that amazing sophomore run. At the end of last season, the blood feud between the Givens and Bennett clans boiled over, and Raylan got himself shot. "The Gunfighter" picked up from there as we saw Winona get the news during a courtesy stop, and once she got to the hospital she found out that he was going to be alright. The story jumps to three weeks later, and Raylan's dealing with his gunshot wound and being forced behind a desk until he's recovered, but things get complicated after Boyd Crowder paid him a visit which ended in an old-fashioned brawl between the two of them. Apparently, Boyd's still upset that Raylan didn't hand over Dickie Bennett like he said he would which meant he wasn't able to get his revenge on Dickie for shooting Ava. Once the dust settled, Givens was asked by fellow Marshal, Tim Gutterson, to help him out on a murder case that involved a fugitive by the name of Fletcher "The Ice Pick" Nix. This bad, bad man was hired by Emmitt Arnett, a real estate developer and member of the Dixie Mafia, to rob the victim so he could settle a debt with a shady man from Detroit, but things didn't end so well for Mr. Arnett. Once Nix realized that Raylan was on his tail, he paid him a little visit and challenged him to a game that involved seeing which one could grab a gun sitting in between them and shoot first. Of course Raylan was able to get to the gun first since he's an infamous gunslinger ... and the main character. While Raylan had to deal with ice pick wielding killers, Boyd had to deal with being locked up in prison for assaulting a federal agent while also trying to run his illegal business while on the inside. You see, after Mags Bennett killed herself, Boyd and his crew were able to get their hands on all of her marijuana crops. The plan was to sell the lot, but the stash was ruined by mold, mildew and varmints. When Ava told Boyd about the developments, he ordered that it all be burned, but Devil and Arlo Givens had other ideas. That is until Ava laid down the law by cracking Devil across the face with a frying pan. As for Boyd, it wasn't all doom and gloom because it turned out that he was transferred to the same prison where Dickie was being held. Interesting. From the looks of it, we're in for two distinct story arcs. The first will follow Raylan as he investigates the man from Detroit and gets tangled up in the Dixie Mafia, and the other will focus on Boyd's need for revenge and his entrepreneurial aspirations now that the Bennett clan's taken a hit. Between the two, the latter has far more potential than the former. While both Raylan and Boyd bring a lot to the table, I was impressed with Ava during this episode because I've always felt like she got lost in the shuffle. Seeing her take control of the situation involving Devil and Arlo was shocking and a welcomed change, and we wouldn't have had the chance to see that from her if it wasn't for Boyd actions. On the other hand, I'm not quite sure how I felt about Raylan's storyline this time around. Plenty of unique characters were introduced, and I'm sure they're all going to cross paths with Givens sooner or later, but there was too much going on for me to appreciate all of it. For example, we got at least two new characters weaving in and out of a minor storyline that was brought up in Season 1, and we didn't get a good understanding of what their roles were. Also, the fact that they a tad bit over-the-top gave them Bond villain-like qualities, so it was hard to take them seriously. Although, I do hope we see more of Nix before the season's through. Justified still has one of the best themes songs on TV today. Do not mess with Ava Crowder. I'm liking this new side of her; it's very Gemma-like. The showdown between Raylan and Nix was intense! Boyd: "Well now, if I found that kind of money, I'd be in Mexico by now." Raylan: "Boyd, I've been to Mexico, and I don't think you'd like it." Raylan: "There's a lot of Mexicans." "Now, I don't like wearing a mask. I'm too pretty, so I am going to have to kill you..."
"The Gunfighter" was able to kick-off Season 3 somewhat successfully. It wrapped up everything that happened last year while setting the table for what's to come, and it also introduced the audience to new and exciting characters. The thing is, I'm not quite sure everything that was given to us will be able to live up to the greatness of last season. Now, I'm fully aware that we should judge Season 3 on its own merits and that this is only the first installment of the current run, but it'll be hard to top Mags Bennett.